My daughter and I most recently visited Washington State in early August. The priorities of this trip were to visit family there, and show my daughter some of the natural wonders of western Washington. Washington’s beauty is immense and breathtaking, from the beaches that meet the rainforests, to the Cascade Mountains, most notably, my favorite place on earth, Mt. Rainier in all it’s snowcapped glory. I personally haven’t been there since around 1989. A much, long overdue visit to see my aunt and cousins. Of course, I did stop at many roadside oddities and took pictures – Bigfoot is everywhere! And popped into a couple of antique stores to look for dolls. Oh, and I love the pacific northwest native american art, with their bold shapes and colors! Many a quick pull-overs to take a pict of a totem pole! And yes, a couple of quick cemetery stops. Only a couple. After visiting the mysterious Mima Mounds very near Littlerock, my cousin gladly showed me the Delphi Pioneer Cemetery, very close to the eastern border of Capitol State Forest. Most of the old cemeteries that I came across, included the word “Pioneer” in the name. Unlike the cemeteries back east, where you can find graves dated from the 1600’s, these cemeteries are dated only from the 1800’s. Hundreds of thousands of settlers, farmers, miners, ranchers and their families traveled from east to west through the Oregon Trail corridor to follow their dreams of new homes, farmlands and even gold. Many were buried along the way, suffering their fates from disease, accidents and even Native Americans. My ancestors traveled this route, but first, Delphi Pioneer Cemetery. This cemetery was established in the late 1800s and has graves dating back to the 1890s. It is still used today, as my cousin recognized many individuals laid to rest there. This cemetery is set back from the road, and contained in a small clearing, in the forest. The cemetery on three sides is surrounded by the forest, with the front fenced and gated in. It has a most unique, moss-covered stone arch at it’s entrance with the worn, wooden, cemetery sign hanging from the arch. A cross adorns the top of each pillar. 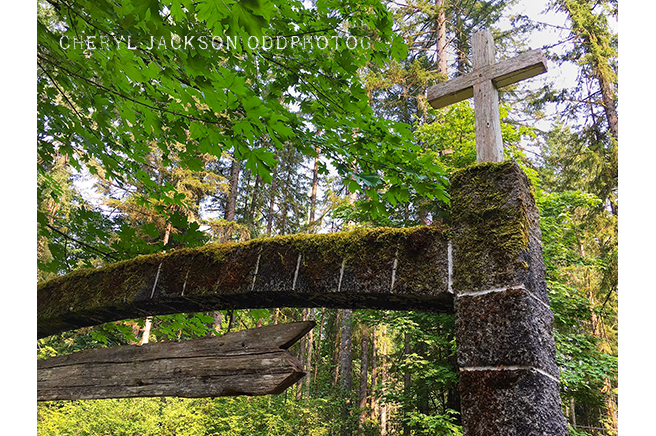 I also visited the Oddfellows Cemetery in Tumwater. Both my mother and my father were from the Pacific Northwest. My mother growing up here, in Washington, and my father growing up in Montana and Washington. I could just spend a week or more there digging into all sorts of family genealogy! Believe me, I picked at my Aunt’s brain about who’s who in family photos and where my ancestors from both of my grandmother’s sides are buried. And my cousin drove me to many family historical locales. My grandmother from my mother’s side, was a Jeffers. Her uncle and cousin (gee, I hope I got that right), were Joseph and Vibert Jeffers. Very well known photographers in the Olympia area, having a photo studio in downtown Olympia and taking many images important to the history of that area. I even had my photo taken by Vibert in his studio when I was a child, as did much of my family and my siblings and cousins. While Joseph was photographing with Vibert, his son, in a very rugged, remote area of the Olympic Mountains, Joseph disappeared over a cliff into a crevasse, never to be found. They named a glacier after him - Jeffers Glacier. On my other grandmother’s side, my father’s side, is the Rutledge family. I am a descendant of Edward (signer of the Declaration of Independence) and John (integral part of the US Constitution). The Rutledge family was one of those early pioneer families who traveled west, settling in nearby Littlerock. My goal here at Oddfellows Cemetery, was to find all the family headstones and photograph them! Well, it turns out, there are many more Jeffers in Oddfellows than I realized, I guess spread out some, so I did miss many, to my dismay. For the other side of the family, the Rutledges, there were four rows of them! I still need to review and sort out who they all are. I even took the time do gravestone rubbings of both sets of my grandparents, which I have never done before, and I was quite pleased with the results! Oh, so my pioneer, Oregon Trail, family story... you know I could ramble on and on, but just trying to keep side stories to a minimum. In 1852, my Rutledge ancestors, traveled ultimately from Iowa, (William originally residing in Maryland, making his way to Ohio eventually during his life then on to Indiana then Iowa) along the Oregon Trail to eventually settle on land in what is know as Littlerock, WA. Littlerock was named for the large rock outside of his homestead, that people would step off on from the horse and carriage. That is the super abreviated version, as I have pages of their journey there. Back on track, what I would like to talk about are the unique things that I have found in the two cemeteries that I visited in Thurston County. Things that I haven’t seen, or probably will not see on the east coast. The first thing I noticed, that many gravestones are etched with the image of Mt. Rainier, that shows how eternally people love that mountain. Modern-day landscape laser etchings of the mountain to some older, simpler ones. The second unique thing that caught my eye, were these tombstones that had color inlay in some of the shapes on the stone. The shapes were inset with the color laid on top. And all of those that I saw, the colors didn’t seem faded. For example, roses decorating a tombstone – the rose was inlaid with red, while the leaves and vines were inlaid with green, all on typical colored granite stones, mosty laying flat. I even looked it up online and couldn’t find anything on that, so I need to dig more on how they were made. Please email me if you know anything about these uniquely engraved tombstones. They are simple, yet striking to me! Again, I have never seen anything like that here on the east coast. Another thing, although I’ve seen it done here, but more frequent sightings out there, of where people put their professions, or hobbies on their tombstone, I think a nice touching add to tombstones. It gives a little more personal information about the one laid to rest there. And finally, I have seen the use of actual photos on tombstones, but usually contained in the small, round, ovals. Some, I’ve even seen with a hinged cover that protects the wear of the image, that you can lift up, or some are just stuck on somehow, and some even laser etched. So hoping I can explain this properly. An area of a tombstone is inset, usually rectangular in shape with a border, and usually of a decent size, with an image placed in there. The the image is covered with some type of see-through material. Perhaps glass? Again, this method was unique to me, and it instantly caught my eye as something new. But I saw it done many times while I visited these two cemeteries. For such a taphophile as myself, I didn’t venture but to only two cemeteries this trip. Family time and the sights were much more valuable to me and my daughter. Besides, I couldn’t travel all the way to Washington, and drag my daughter to nothing but cemeteries. She used to like going with me, but I guess I’ve worn her down. I was excited though, to visit even just a few cemeteries on the Pacific Coast, most importantly, where my family is laid to rest. My two sisters said to make sure I visit that cemetery. It was already on my to-do list of musts! I hope to visit again soon, and find some missing pieces to my family/cemetery puzzle. If you ever have the chance, visit western Washington State. You too, will be struck by its amazing, jaw dropping beauty! Thank you for reading!